There are so many diets and weight loss plans out there. It seems we are often bombarded with new ones and they often seem to contradict each other. So, we wanted to take a look at what the research says, what are evidence-based- tried and true- weight loss strategies. We found that there are 3 key elements in the research: changing what you eat, exercise and behavior therapy. The evidence shows that a goal of 10% of your baseline weight is attainable and most beneficial for your health. Losing the weight at a rate of 1-2 pounds per week for up to 6 months is also most likely to be maintained for a long time. Also low-calorie diets (500-100 kcal per day reduction) vs. very low-calorie diets (weight loss may be faster at first but not as sustainable). Evidence also shows that reducing specifically unhealthy fat and carbohydrates is key to weight loss as well as increased water, veggies, fiber and whole foods. Exercise is the second element of weight loss. It modestly increases weight loss, decreases abdominal fat, increases cardio-respiratory health and helps maintain weight loss. Research supports working up to 30-45 minutes 3-5 times weekly and eventually working to a maintenance exercise pan of 30 minutes most days. The third element of weight loss is behavior therapy. 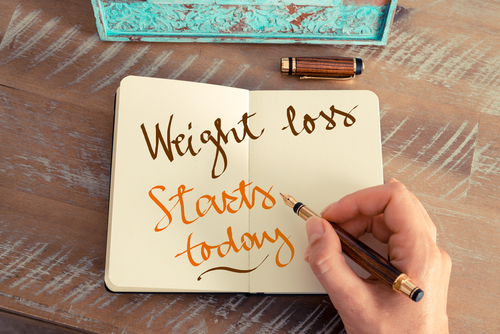 This is working with dietitians and other health professionals to reinforce goals and decrease barriers to weight loss. An interesting resource we have in the United States is the National Weight Loss Registry. People who have lost weight and kept it off enter in their information and all information is compiled and evaluated to review trends of successful weight loss and maintenance. These are consistent with the evidence based components of weight loss we have addressed. 98% of the participants changed how they ate. 94% increased their physical activity. 90% exercise on an average of 1 hour per day.